Today at 12 I had to drive all the way to Kout Mall in Fahaheel to meet-up with a new client. I had been to the Kout Mall twice before and twice the mall wasn't finished. This time when I went though it was practically done, 98% of the stores were open and the whole place looks like its doing good. They are even opening a Sultan Center there. I personally don't like the mall, its too small and definitely not worth the 30 minute trip to get to it. 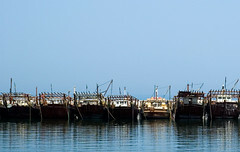 On the way back to the car I snapped a picture of these old fishing boats that were parked in the small marina.